During the past month or so I've noticed quite a few writers having a grouch on their blogs about their writing spaces. Either they're too small, too hot, don't offer an inspiring enough view from the window or have some other problem that's causing them grief. I'd just like to say to all of you (no names, you know who you are) that whether you believe it or not, you're actually lucky to have a space to call your own. Having a place where you can go to write, keep your PC, notes, pens, pads and other paraphernalia, pin ideas to the wall, listen to inspiring music, keep your book collection or whatever else you do in your 'office' isn't something all writers have. I write wherever I can. That's usually my bedroom, sitting on the bed with my laptop perched on my knees. After a while, that becomes extremely uncomfortable but I have no choice. There isn't room in the bedroom for a table, desk or anything similar, nor is there room for a comfortable chair. Richard works in the living room (he's also a writer) and as we spend too much time talking and not enough time writing when sitting together, that's out of the question. I could use the kitchen table, and indeed do on occasion, but I find it difficult to concentrate on my work when I'm surrounded by reminders of domestic chores that ought to be done (there's always an ironing pile staring at me; the dog brings mud in all over the kitchen floor; I start planning meals, etc.). There's no cubby hole under the stairs and the loft isn't of the type that can be converted. Even the landing doesn't have room for anything more than a bookshelf. The downstairs hall is about 1.5 metres x 1.5 so no hope there, either. We've considered an extra shed in the garden (after the girls of the NWG put the idea forward at the pub a few weeks ago), but can't see where we'd put that, either. Not without chopping a tree down and that's something I really don't want to do. We need all the trees we can get! I'd love to have a little space to call my own but I don't have one and the likelihood of getting one in the near future is very slim. But what's the point in complaining? That isn't going to get me one, is it? Hard work is probably the only way I'll ever get one, and if that means balancing my laptop on my lap, so be it. I don't mean to sound preachy but instead of complaining about what you don't have, how about concentrating on what you do have instead? I don't have an office or anything even remotely resemblant of one, but I have a house where I can feel warm and secure, a family who respect my need to write, and enough imagination to be able to do so. That's not bad, really. I've heard of writers who have had to go out every day in order to write because their families simply haven't respected their need to write. At least I don't have to do that! I've heard of writers who couldn't afford to pay the electricity bill and have had to sit in a cold room, huddled up in blankets in order to write. At least I don't have to do that! I've heard of writers who have been homeless. At least I have somewhere to live! Writers write. A pen and paper is all that's really needed. Everything else is a bonus. Today I'm going to point you in the direction of The Nantwich Writers' Group Message Boards. We've had a steady flow of new sign-ups but few people are posting and those who have hadn't had much response. It's a shame because I honestly believe the forums could be a useful resource and for me personally, it's sad to see my hard work just laying there barely used. So get your backsides over there now and start posting. Please? PS: I just rounded 2,000 visits to my blog. That called for a celebration so I had a rum & raison flavoured choc ice! Yum! Hmm... now that's worrying. Not that you didn't ought to be here (although I wonder what you should be doing instead) but that you couldn't log in. If you try again, can you let me know exactly what the error message says so that I can look into it? Cheers. 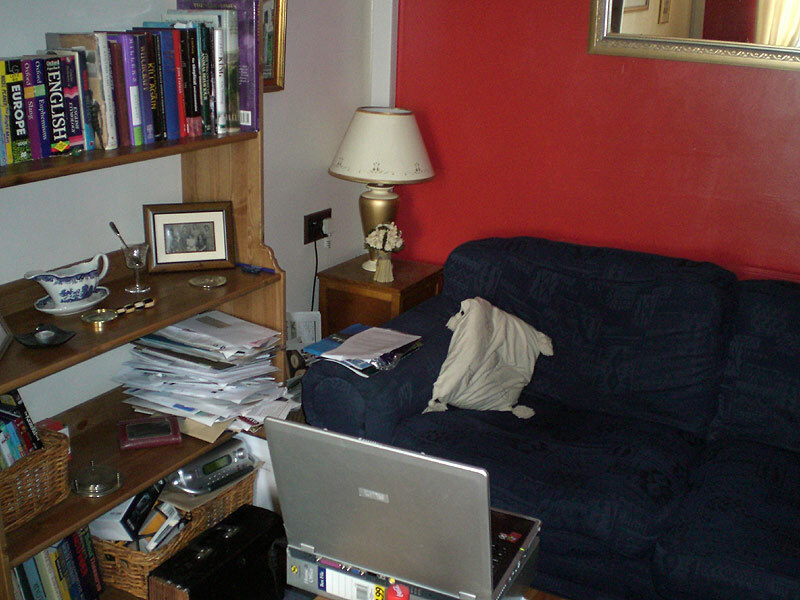 Sharon, I long for my office in Nantwich, now vacant and about to become the sitting room/office/adjunct to the living room of another family. I have abandoned our usual borrowed premises in Quebec for a two-week marathon of visiting in Ontario and New York State, so for now I must perch my laptop wherever I can find a vacant spot - admittedly, not very difficult. I know the feeling, Debs. I know we all have a grouch about things even though we know damned well that there are others far worse off than ourselves but sometimes we just need a reminder that we should perhaps be looking at how lucky we are instead of how hard done by we feel we are compared to those who have what we don't. Sure, everything's relative but life's so much better when we can appreciate what we have instead of fretting over what we don't have, isn't it? Eva. Exactly! If you really want to write, you'll write regardless. I think perhaps everybody should experience not having a comfortable space to write in because then they might appreciate what they have just that little bit more. Hmmm... I sounded very undecided with so many 'perhaps' in that last comment. Ignore that word, will ya? Ta. You took me back many years to when we rented a tiny farmworker's cottage. Our only heating was a fanheater which we couldn't afford to use and an open fire in the living room. I was designing and selling knitwear at the time and used to knit in front of that fire, as it blew smoke into the room, with the window open so I could breathe, under a duvet with hot water bottles! I quite liked the conquering of the adversity, but I wouldn't want to turn the clock back! Sounds remarkbly like a place I once lived in, Cherry :) I learned a lot from that experience and, looking back, wouldn't be without it, but like you, I wouldn't want to turn the clocks back, either.